Business linkages between transnational corporations (TNCs) and local suppliers can be a channel for the transfer of technology, knowledge and skills to host economies. This can enhance the competitiveness of developing countries and help them to capture the opportunities for increased trade and investment brought about by globalisation and economic liberalization. 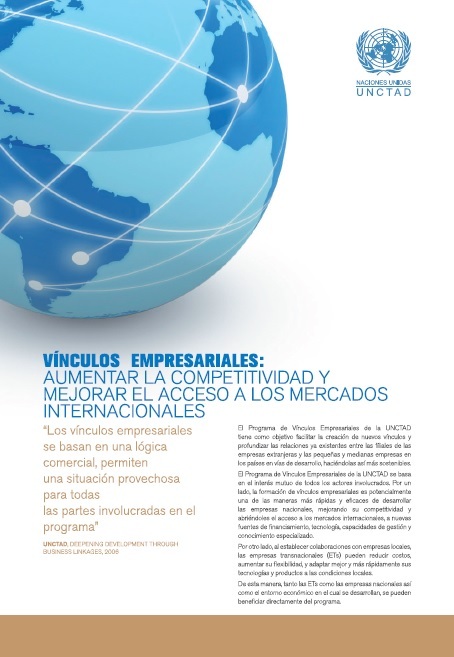 UNCTAD is uniquely positioned to play an intermediary role in such a comprehensive approach to the promotion of sustainable business linkages and to provide a combination of advisory (policy-oriented) and technical assistance (action-oriented) services in the field of foreign direct investment (FDI) and enterprise development.